This is a weird race where many of the runners who are likely to take money have not yet run fast enough to win at this level. I’m skeptical of competitors like Francesco Appeal (#2) and Moon Over a Beauty (#4), who are both stepping up in class. A more logical option is Los Borrachos (#3), but he’s a late runner in a race that does not feature that much early speed. Instead, I’ll take the horse who has run fast enough to win this race, even if he hasn’t done it recently. STORY TO TELL (#5) put forth some impressive efforts over the winter but appeared to tail off after the inner-track season. 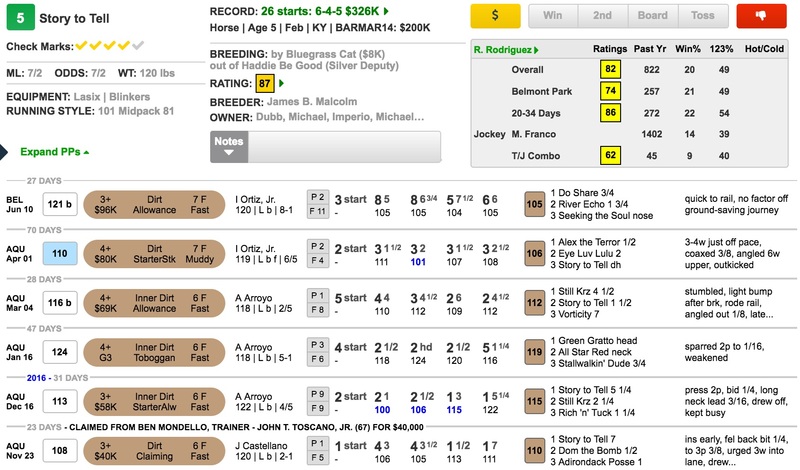 He returned last time at Belmont in an ambitious spot, and he actually ran better than it appears. Irad Ortiz Jr. was oddly passive in the early portion of that race, and Story to Tell was shuffled to the back of the pack. The horse clearly had some run late, but he was left with too much ground to make up in a race that mostly held together up front. He’s better when he gets a more aggressive ride, and Manny Franco should have him placed closer to the pace here. I’m hoping that the track dries out a bit by the time this race is run because he prefers fast going.